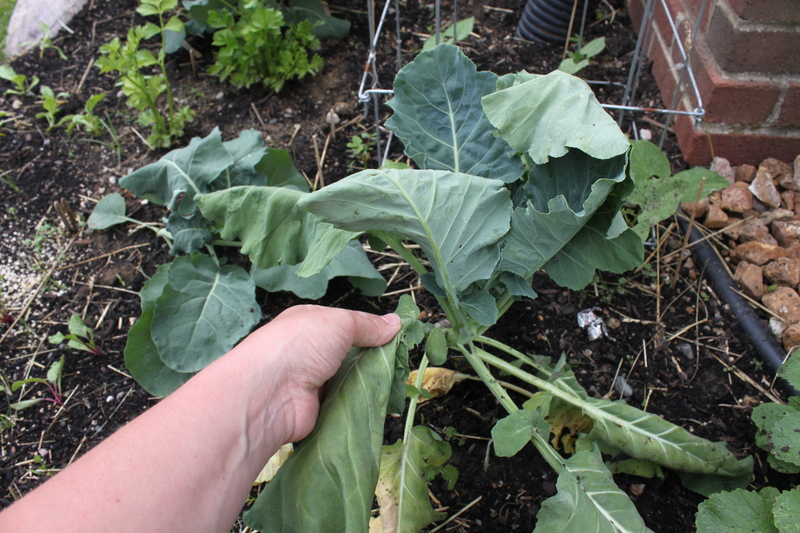 I had quite a bit of trouble trying to diagnose what was causing my collards, bok choy, and broccoli to wilt. There are a few different things that can cause it. My first thought were fungal pathogens. 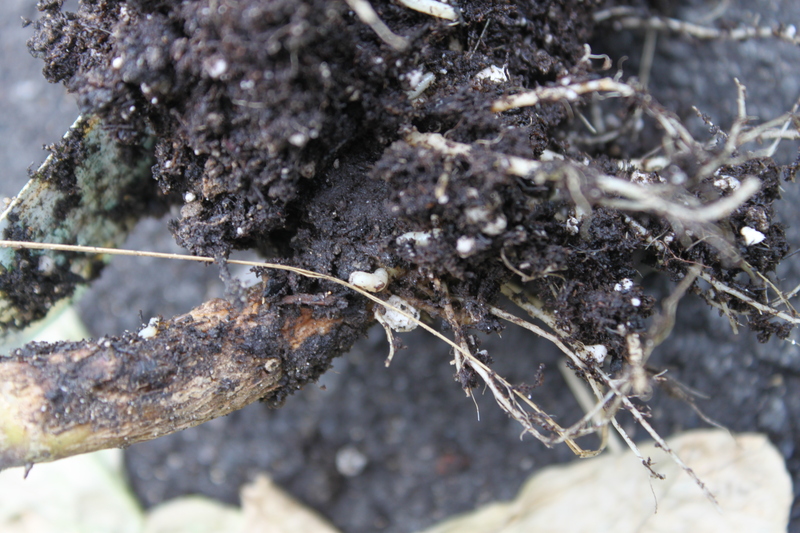 I’ve dealt with them before, primarily root rot with squash when I was living and gardening in Chicago. I’ve never had root rot affect my brassicas though. 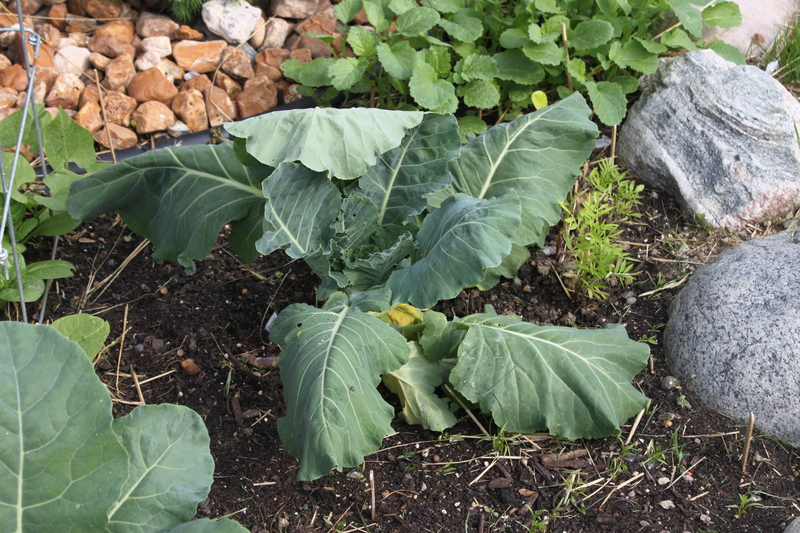 Some more research made me thing that it was perhaps clubroot, which is common in brassicas (like collards, bok choy, cabbage, broccoli, etc). 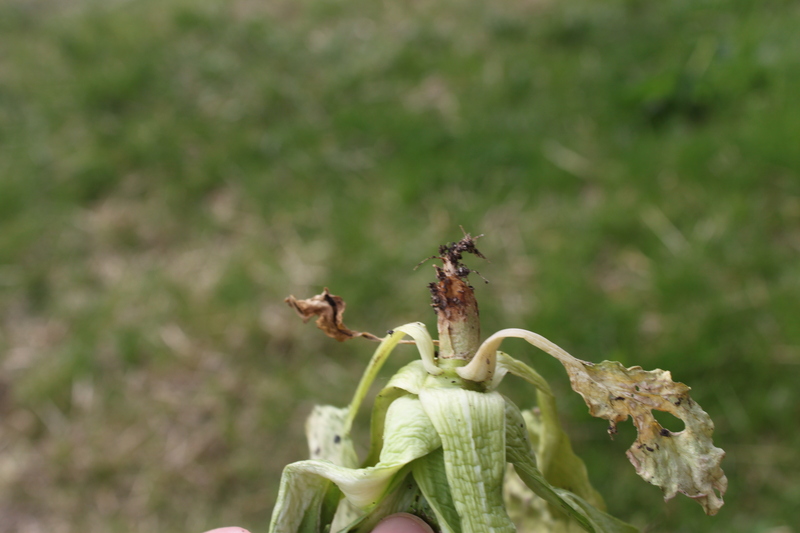 Or there was also the possibility of pests, specifically the cabbage fly whose larvae attack the roots (cabbage root maggots – ick)! My garden had been going ridiculously good so I knew it was about time for something a mishap to arise (Life’s not perfect you know?!) 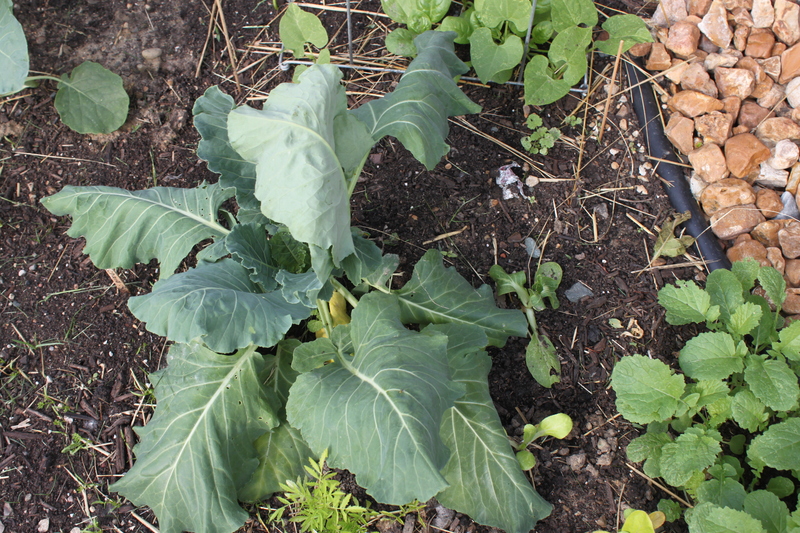 Before I get into the ick – take a look at my beautiful collards, bok choy and broccoli plants while they were going strong on May 22, 2015! So pretty! I watched it for a few days I realized that the wilt wasn’t getting any better, in fact, it looked worse. Then I realized that the bok choy next to it had shriveled up into nothing. Bummer! Take a close look at the picture above – see that little shriveled thing to the right of the collards? That’s the bok choy that looked beautiful 1 week ago. 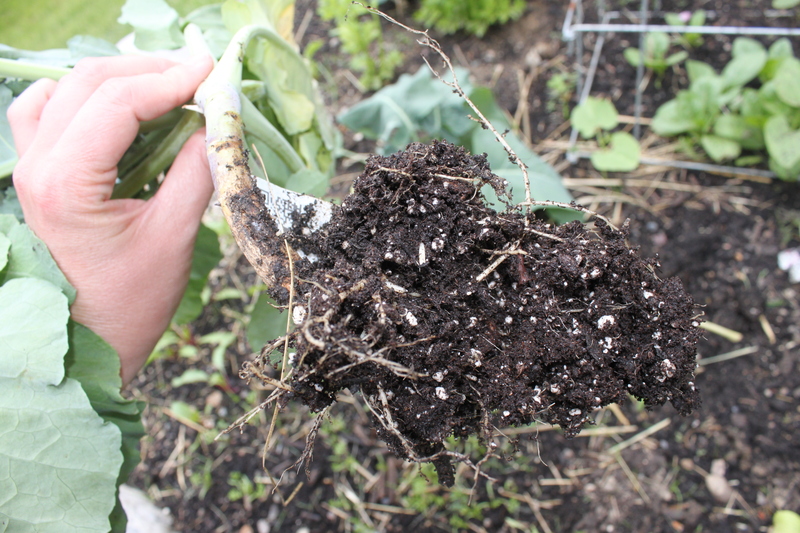 Because the bok choy was already inedible I decided to pull it up to see if I could get a good look at the roots. I was really thinking that it was club root at this point. Here are the roots of my shriveled bok choy. What do you think? I was puzzled. It didn’t look like the swelled up bulbous look of club root but it was discolored a bit (kind of orangy) and the smaller roots were gone. I had to figure out what it was. I researched for a few days more and finally decided that I was just going to pull up the collard plant because it was pretty much gone anyways and there’s only so much researching one can do – it’s just really hard to tell the difference between fungus that rots away the roots and root maggots (plus I had an extra zucchinni plant I could put in it’s spot). Here’s what it looked like before I pulled it up. 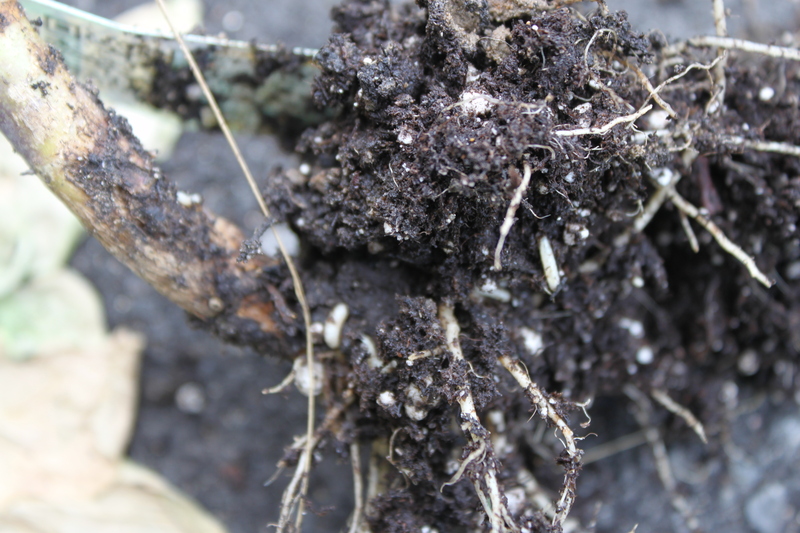 Well, it’s been about 3 weeks now since I had to pull up one of my collard plants and found out that I had cabbage root maggots (still makes me squeam – eww). The nematodes I had ordered on Amazon took a few days longer to ship than they had said they would (not sure why) so I never actually sprayed them. Why? One, because it needs to be a bit cooler (I put them in the fridge to spray before my fall planting of brassicas), and two, because the Neem oil WORKS!